April 18 is the International Day for Monuments and Sites or World Heritage Day. For 2011, the theme is: The Cultural Heritage of Water. According to ICOMOS, "Water is one of the key resources required to sustain life. It has led to the development and generation of significant material culture in the form of items, technology and places. How to obtain it, how to store it, how to harness its power and conserve it has motivated human endeavour in a myriad of ways. It has also been the catalyst for the development of significant cultural practices which have generated intangible cultural heritage values. It has inspired poetry, literature, artistic endeavour such as painting, dance and sculpture. It has informed and inspired the development of philosophies and religious practice. The cultural heritage of water, therefore relates not only to the technology and architecture that humankind has developed to manage, utilise and celebrate its life giving properties but also to those intangible values that have shaped our beliefs and practices." 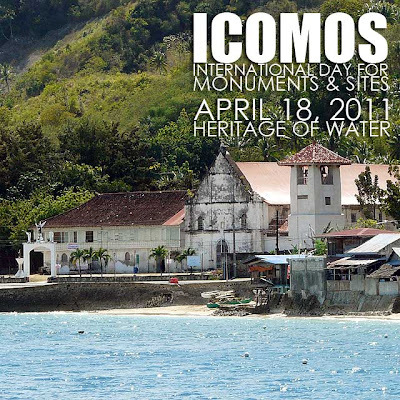 Ivan Anthony Henares, a member of the ICOMOS Philippines National Committee and expert member of the International Cultural Tourism Committee (ICTC), writes about the cultural heritage of water in the Philippines in International Day for Monuments and Sites 2011 celebrates the cultural heritage of water.